Hurricane Alex has formed in the Atlantic, a very rare occurrence of a sub-tropical storm which has reached hurricane strength in January. Hurricane Alex currently has 85mph sustained winds and is tracking north towards the Azores. The formation of a hurricane in the Atlantic in January provides a reminder for the insurance and reinsurance sector that weather and meteorology can be unpredictable and seasons can be extended, if conditions are right. To give you an idea of just how rare this is, only two other January hurricanes have been recorded before, a storm named Alice which actually formed in December 1954 but was a hurricane in January 1955 and another hurricane in 1938. Hurricane Alex, as you can see above, is forecast to track north through the Azores before heading on towards Greenland as an extra-tropical storm. Currently packing sustained winds of 85mph and higher gusts, the National Hurricane Center predicts that little change in strength is forecast over the next 24 hours. The Azores meteorological service has issued a hurricane warning for the islands of Faial, Pico, Sao Jorge, Graciosa, and Terceira in the central Azores, and a tropical storm warning for the islands of Sao Miguel and Santa Maria in the eastern Azores, according to the NHC. The center of Alex is expected to pass very close to the Azores on Friday morning, with 3 to 5 inches of rain possible and isolated maximum amounts of 7 inches, which could produce life-threatening flash floods and mud slides. A dangerous storm surge is expected to produce significant coastal flooding near and to the east of the center of Alex, the NHC said, while this will be accompanied by large and damaging waves. 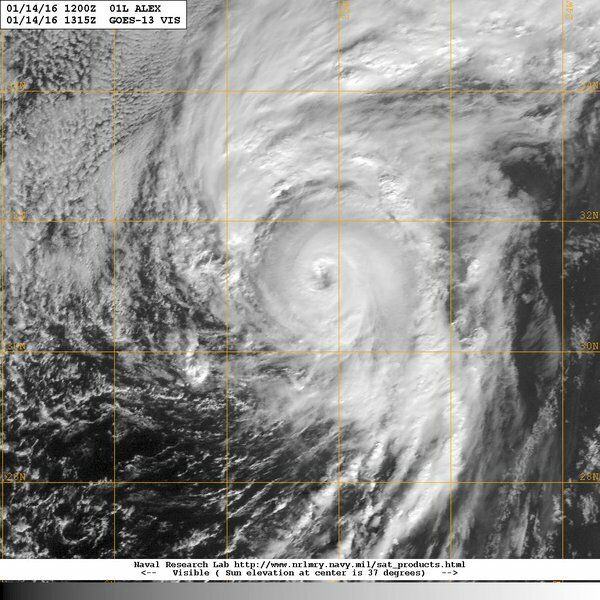 Alex is a very unusual storm, forming at a time of year when hurricane activity in the Atlantic is unexpected. Posing little threat to the insurance and reinsurance industry Alex may be seen as an anomaly, but it should serve as a warning that hurricane season can be extended, if the meteorological conditions are conducive.